The way I think about the Disney company of the 1950's is defined simply in one word: whimsy. I'm shying away from the word magical for a few reasons, one because it portrays a sense of naiveté that I don't dare bestow upon the company, and two, because it is a blog cliche at this point. Within the Disney community there are definitively esoteric sub genres of fandom...diverging from one central axis, Walt Disney. Animated features, Disney theme parks, short cartoons, cruising, merchandise...for crying out loud, even FOOD has its own short list of dedicated blogs. As Disney fans we have a wealth of steady news, images, sound files, and fun. At this point it is rather hard to keep up with it all. In keeping with the whimsical nature of the empire that he started, Walt was notoriously able to utilize his employees both within and out of their comfort zones. Unknown talents brought to the surface by a man whose reputation was on the line. Screwing up was not an option. It seems like the jack of all trades idealism that Walt had for these guys was inspirational on some level, prompting mid-afternoon hoopla fun and renegade dixielanders The Firehouse Five Plus Two. Comprised of Disney employees, including two of Walt's nine old men Ward Kimball (trombone) and Frank Thomas (piano). Also in the group, playing banjo, is Harper Goff well known for his work on the 20,000 Leagues Under The Sea Film as well as concepts for Disneyland. The groups first notable appearance was on national television, during the One Hour In Wonderland Christmas special hosted by Walt in 1950. Though only on the screen a few minutes the group is exceedingly charming. They rip through Jingle Bells like no other band, adding a lot of childish fun to an already fun song...these guys knew how to be silly. 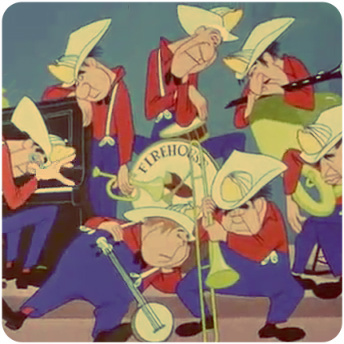 A few years after their television appearance they made their way to the big screen, via the 1953 Goofy short How To Dance in which the band supplies the music for Goofy to stumble over. The band played at Disneyland on opening day in 1955, appropriately at the fire house on main street. They moved from main street to Frontierland, where they went on to play at the Golden Horseshoe for years, drawing large crowds of people. 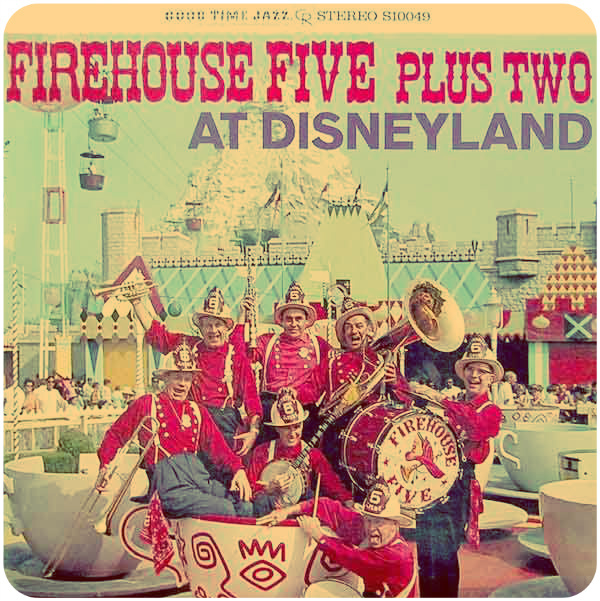 The Golden Horseshoe also provided the backdrop for their 1963 album The Firehouse Five Plus Two At Disneyland. The fact that not only did Walt allow these shenanigans to go on during office hours, but whole heartedly encouraged it is a wonderful testament to the company at the time. This sort of fun rarely goes on, and is certainly never encouraged and publicized. The idea that men in the animation department had extreme talents outside the parameters of their job description is an inspiring and wonderful side note in the grand scheme of this company. A terrific legacy and ode to how functional creativity can survive and thrive. Encouragement is the key in this scenario...without it nothing can be fully realized in the creative field.